Felix Baumgartner completes final test jump from 97,145.7 feet/29,610 meters on July 25, 2012, for the Red Bull Stratos mission, which aims to set the world record for highest skydiver by leaping from 120,000 feet and breaking the sound barrier. Austrian daredevil Felix Baumgartner will try to break world records when he leaps from higher than anyone has jumped before on Tuesday (Oct. 9), and anyone can watch the feat live online. 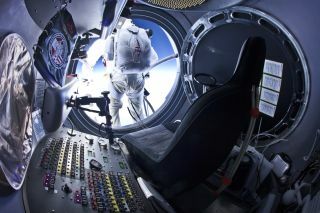 You can watch the skydive, called Red Bull Stratos, live here on SPACE.com. The flight was originally scheduled for today (Oct. 8), but was pushed back a day because of a cold front at the Roswell, N.M. launch site. Baumgartner will launch in a balloon and fly to almost 23 miles above Earth, before jumping out. At an altitude of 120,000 feet (36,576 meters), the skydiver will begin a freefall that will send him driving toward the ground faster than the speed of sound. Once he gets closer to Earth, he'll open a parachute to cushion his landing. Baumgartner and his crew plan to begin the mission in Roswell in the "wee hours," Red Bull Stratos spokesman Derrick Lerum told SPACE.com. "The timeline isn't really set in stone because of weather conditions," he added. The team is hoping to launch between 6 a.m. and 9 a.m. local Roswell time, or 8 a.m. and 11 a.m. EDT (1200 and 1500 GMT). The balloon carrying Baumgartner's capsule is 55 stories high, yet its walls are 10 times thinner than a plastic sandwich bag. For the safety of the balloon, wind conditions at launch time can't exceed 2 mph (3.2 kph). The skydiver will ride aloft in a specially made 2,900-pound (1,315-kilogram) pressurized capsule. One of Red Bull Stratos' advisors is the current world record holder for the highest skydive,Joe Kittinger, who leaped from 102,800 feet (31,333 m) in 1960 as U.S. Air Force captain. Baumgartner, who is 43 years old, has previously crossed the English Channel on a carbon wing and leaped from many of the world's tallest buildings. Although Red Bull Stratos' leaders have said Baumgartner's dive will begin "at the edge of space," the boundary of space is generally thought to be 62 miles (100 km), or 327,000 feet, high. Red Bull is also broadcasting video of Baumgartner's attempt on its website and on YouTube. To receive updates about the Bed Bull Stratos launch timing, you can sign up via the project's Facebook page, or follow Twitter for updates @redbullstratos.